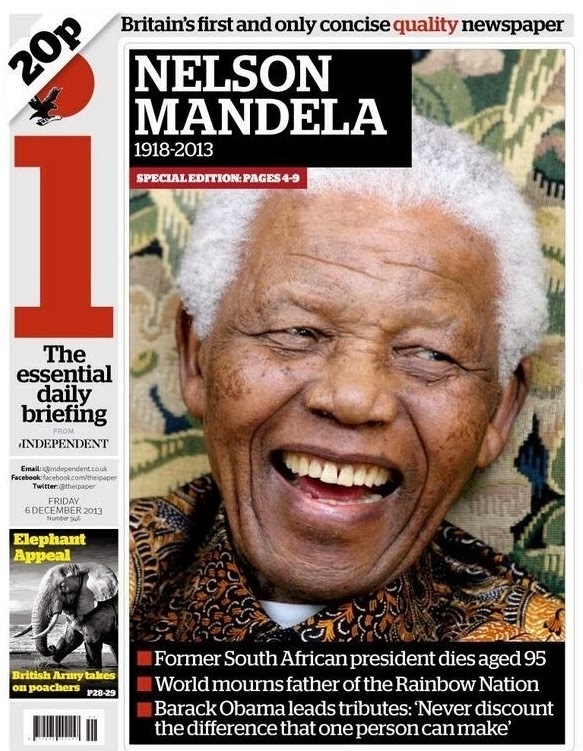 What is the point of a newspaper's front page? Is it to tell the most important stories of the day? 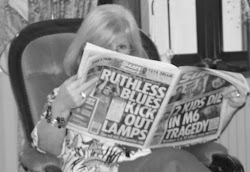 To look good on the news-stand? To advertise what's inside? To show what the editor cares about? To make a statement on great issues for society? Is it to entice casual readers to buy? To give regular readers a sense of common cause? To make people say 'Wow!'? To shock, surprise or intrigue? To provoke laughter, tears, outrage or pity? 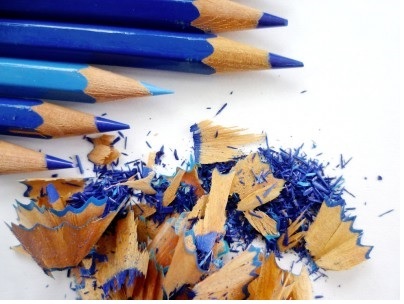 To stir readers or politicians into action? What matters most? The headline or the picture or the puff? And when is a story so big that one or two of the three must be abandoned? If you go a-googling or a-tweeting today, you will find many collections of front pages from all over the world, often with an assessment on which is 'best'. In this context 'best' generally means the most visually striking. 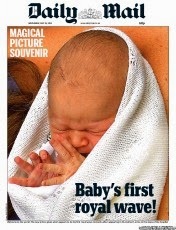 It could be argued that the Mail produced the 'best' front page yesterday. It was stark, stunning and a country mile better than today's Mandela effort. But was it the best in terms of news priorities? Or as a clue to what lay within? Every newspaper has a handful of design templates for its front page. 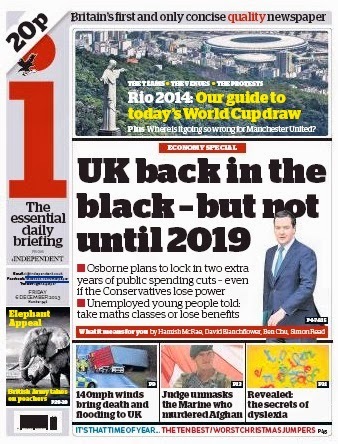 It's not laziness, it's important that the paper has a recognisable 'look' - and that's why commentators queue up to give their verdicts whenever there is a redesign such as that at the Independent papers recently. But when a really big story breaks, the templates are cast aside and original thinkers are given their heads. One of the questions in SubScribe's unscientific survey into reading habits was what prompted readers to buy a paper on impulse. Every respondent chose 'news', all rejecting the puff out of hand. This is clearly not the view that is reaching editors from their circulation managers, since the puff is the element given the closest attention by the most senior executives. Work starts on it first thing in the morning and it is often the last thing to win the editor's approval. Something pretty spectacular has to happen to displace it. For the Mail to reduce the puff to a tiny box on the titlepiece so that it can devote the entire front to a picture of a television cook seems extraordinary. Yes, everyone loves Nigella. Yes, many Mail readers would love to be Nigella. Yes, many readers' husbands wish their wives could be Nigella. Yes, we are all agog at what she has to say about her marriage and her drug-taking. And yes, the paper looked terrific. But wasn't it just a little OTT? To make a judgment on that, it's probably fairest to browse through past papers to see what else has prompted the Mail to shrink the puff to such an extent. In fact, we need go back only three weeks for the last big occasion: Prince Charles's 65th birthday. Before that there were the birth and christening of Prince George and before that Andy Murray's Wimbledon triumph. The puff has survived one-off specials on immigration, healthcare and the economy, and we have to go back to May to find a hard news story that drove it away completely: the killing of Private Lee Rigby in Woolwich. 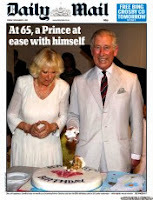 OK, Murray and the royals are understandable, although Charles the senior citizen was odd. But Nigella seems out of place in this company. 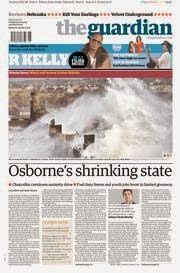 Maybe the paper has made a conscious decision to go for more one-hit covers. They are clean and arresting. But as we see today, if you pull out all the stops when a cook has her day in court, you have nothing left in reserve when the world's most revered man dies the next day. 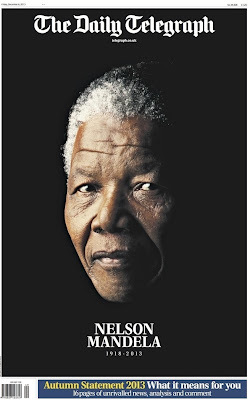 And so we return to Nelson Mandela. Practically everyone picking up a paper this morning will have known that Mandela died last night. Yet that was the one fact that most editors chose to impart on their front pages - whether in stark words or by the tone of the presentation. There was no attempt to capitalise here on the advantages that newsprint still has over the internet and broadcasters, such as extra details and good writing. And quite right. Every instinct says that the occasion demanded one bold statement of respect. 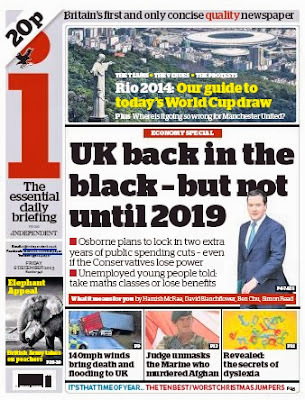 A cynical view would be that papers took the simplest option on what had already been an exceptionally busy night with the Autumn Statement and the gales and floods. But that doesn't hold, since most managed to put together several inside pages as well as adjust their thinking on the front. 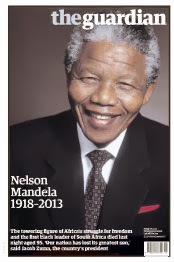 The supplements will have been prepared months ago and updated relatively recently, given Mandela's declining health, but they will still have needed final tweaks. A great deal of work went into producing some magnificent print editions - editions that are increasingly seen as irrelevant in the digital age. And most of that work will have been done by the subs - subs who are increasingly seen as unnecessary in the digital age. A last hurrah? Vanity publishing? Possibly, but who cares, given that the results were so good. The fact that the death announcement came too late for most first editions allows us to see how editorial teams reacted and revamped their papers when they already had a major story that could be demoted, but not junked or shrunk. In the case of the i, we can also see dramatic variations in the 'shopfront' philosophy. This is instructive, given that the i is the one paper that seems popular with a younger audience and is actually putting on a few sales. 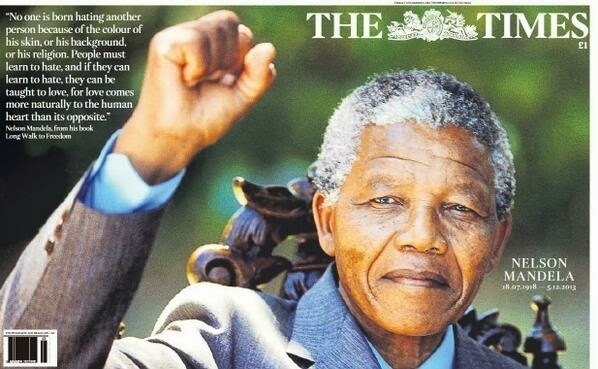 The paper's front is a web-inspired 'home page', with lots of bits to look at - an idea floated nearly a decade ago by Robert Thomson at the Times and put into practice in its international edition. The first edition of today's i had seven elements, the second only two. Both are terrific. The Express also missed the boat on the first edition and was, as a result, subjected to much internet mockery for being 'the odd one out'. SubScribe has had plenty a chuckle thanks to the paper's affection for dementia cures, house prices and the weather. But let's play fair. The weather yesterday was a real story. The high tides brought the worst flooding to the east coast for 60 years - since the 1953 floods that killed more than 300 people. Yesterday thousands of people were moved out of their homes and the damage caused by the water was immense. 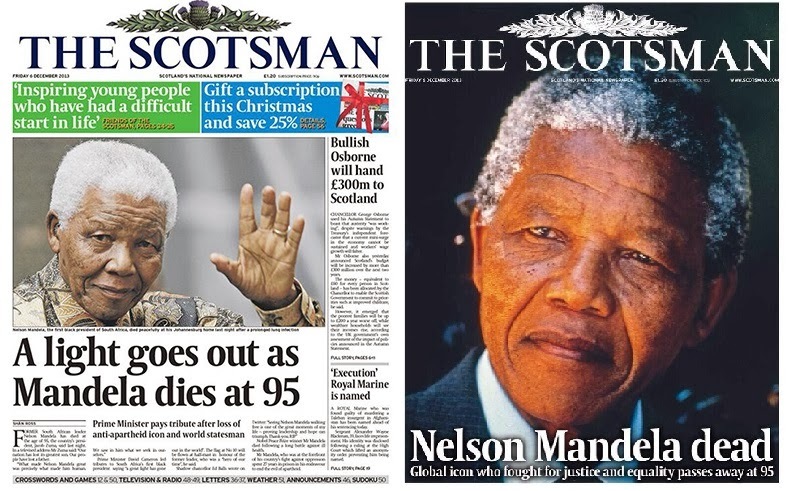 Without Mandela or Osborne, the story would surely have made the lead to every paper. 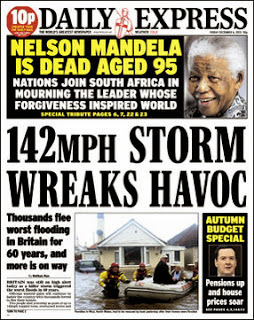 In the event, the storm has perforce been under-reported and the Express may well have been right to stick with it as the main story, even when it changed up to dump the puff and put Mandela's death at the top. 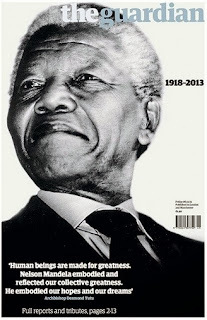 Its readers are not known for their love of the South African statesman. 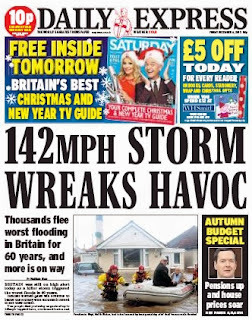 The storms were, for once, not wild predictions but real gales that affected people's lives and homes. 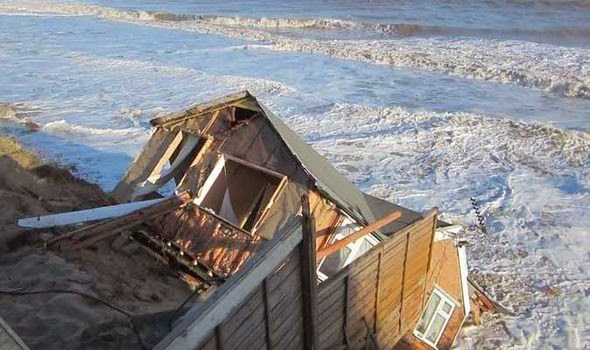 One man watched as his cliff's-edge bungalow was battered and swept out to sea. Hundreds of beach huts in Express reader holiday territory were wrecked. Thousands are without electricity. There was an honesty in this decision-making that wasn't apparent in the hold-your-nose-and-get-on-with-it Mail. Yesterday the paper devoted the front and two spreads to Nigella. 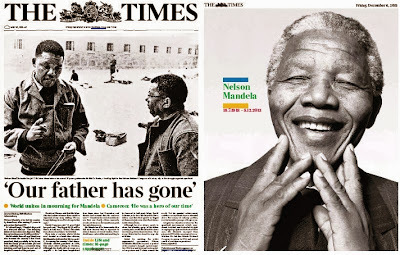 Today the paper devoted the front and two spreads to Mandela. Page One had none of yesterday's clean style and the copy was leaden and matter-of-fact, with no sense that this was a moment in history. 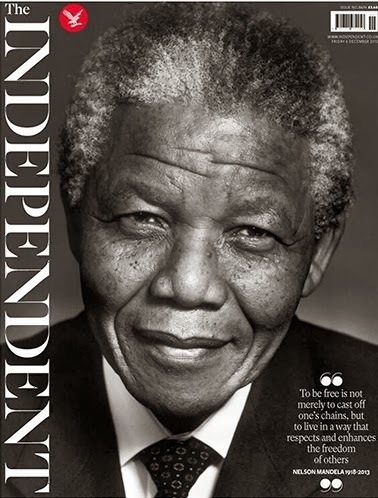 We learnt, for example, that the Duke and Duchess of Cambridge were told about the death during the premiere of a Mandela biopic - a nice snippet for inside, but quite out of place in what should have been a piece of elegance and eloquence. The coverage was worsted only by the Star, which, like its big sister the Express, kept faith with the weather. But was it an intimate knowledge of its readers' interests, a distaste for the man, or sheer doziness that led it to shunt Mandela down to the foot of the page and a one-line crossref to page 11? Almost everyone else shone. Every journalist working last night deserves congratulation for their splendid efforts. It is meanwhile interesting to see how even big events have become templated. The Times, for instance, introduced the wraparound as a broadsheet under Peter Stothard. The success of its tabloid incarnation for the royal wedding and the Olympics has meant that it has been wheeled out rather too frequently for it to remain special. The green background of the picture is rather bilious for me, and the ornate wooden chair behind Mandela's head gets in the way. Has he got a monkey or a crocodile on his shoulder? 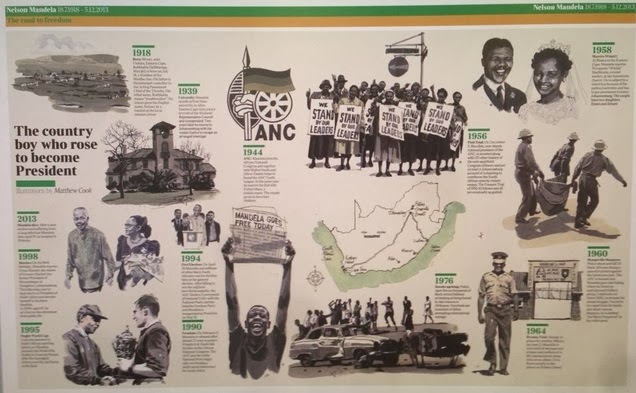 The timeline by Matthew Cook inside the wrap is, however, charming, and the 'real' front page breaks from the crowd with a photograph of Mandela and Walter Sisulu when they were imprisoned together on Robben Island. Another default position that has developed over recent times - seen in practice earlier this year with the death of Thatcher - is the 'big portrait, name, date and quote' formula. It's a simple technique for when a quick change is required. 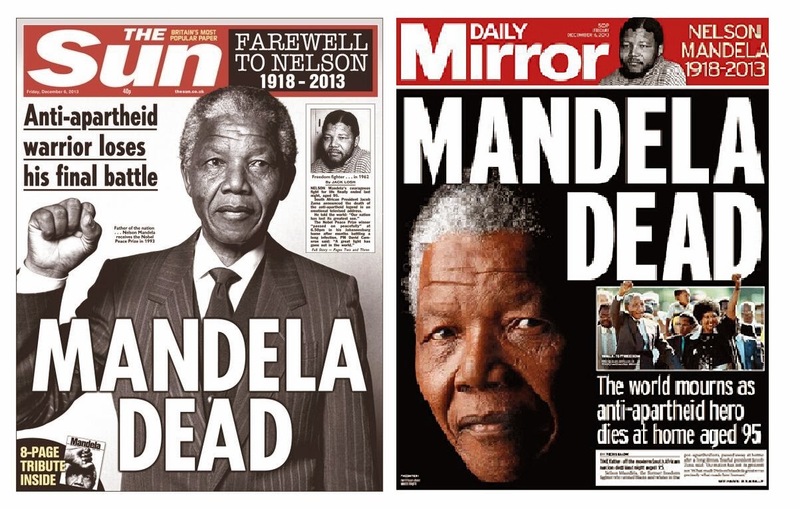 Variations on the theme worked well for the Telegraph, Guardian and Independent. The universal choice of portrait was one of a grey-haired old man, the main difference being whether he was a kindly smiling grandfather or a serious leader. This was, of course, Mandela the statesman whom the world adored, rather than Mandela the young firebrand who inspired love and loathing in equal measure. The redtops and the Mail look cluttered and ungainly by comparison. 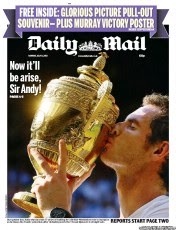 We can also see that having switched splash, our print teams did not rest on their laurels. 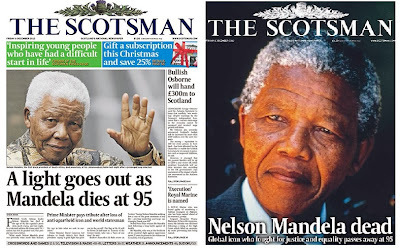 The Scotsman was among those to keep improving through the night, moving from the conventional picture, headline, text combination to end up with the 'iconic' approach. The Guardian also had two shots at its portrait front, one smiley, the other the serious version we saw earlier in this post. 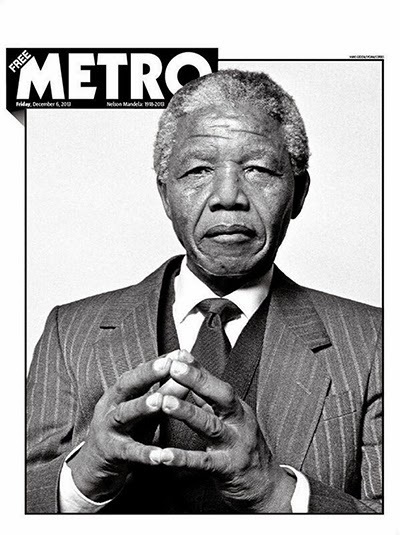 For what it's worth, my favourite was the stripped-down Metro, which wisely decided that no words could do justice to the most famous and revered man in the world. Thanks are due yet again to thepaperboy.com, an assortment of twitterati and Luke Lewis of Buzzfeed for these photographs. For further commentary - and a different perspective, please take a look at Peter Sands's blog. 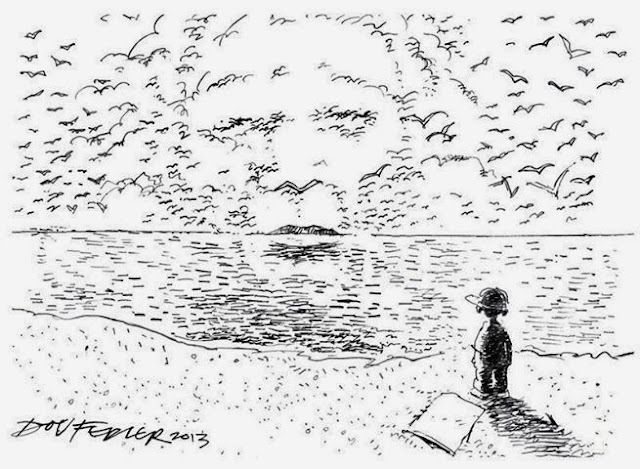 Final thought: SubScribe tends to look only at British journalism, but I am indebted to my former colleague Dennis Rink (@rinked) for sharing this illustration of Robben Island seen from the shore. Dov Fedler has worked as a cartoonist on the Johannesburg Star for more than 25 years and the little paperboy is his trademark. This picture is the most poignant and inspirational tribute I've seen today. Limited edition prints are available by contacting Debbie using this link.